After residents complained that an initial sweep of a homeless encampment under the Pontchartrain Expressway simply moved the collection of tents and panhandlers from one side of St. Charles to the other, New Orleans City Councilwoman LaToya Cantrell is requesting city officials to return and clean out the area closer to the river as well. Cantrell is also introducing a change to the city law that more specifically prohibits camping on public property, but said she is still looking to residents for answers to the larger question of how to get homeless people off the streets instead of moving them from one spot to another. Last Thursday (Aug. 14), city officials ordered everyone underneath the Pontchartrain Expressway from South Claiborne to St. Charles Avenue to vacate the area, with city workers cleaning out debris and garbage that was attracting rodents and closing the area to the public. Residents, however, quickly began to complain that the action merely moved the homeless encampments to the river side of St. Charles Avenue underneath the overpass. On Monday, Cantrell made an unscheduled appearance before the Coliseum Square Association to address some of those complaints. She said that she had been working on coordinating such a sweep since February, meeting with both homeless-services providers and the city’s legal department to create a process that would pass constitutional muster. Residents asked why the action stopped at St. Charles Avenue, and Cantrell said that the city chose that boundary because it’s where the problem was most concentrated at the time. City officials discovered that the areas under three different on-ramps were being used as restrooms, with about a foot of human waste accumulated. Sanitation workers removed it and fire engines had to hose the areas down afterward. Now, Cantrell said, the city is working with the state to determine how to enclose those specific cavities so they will not be used in the same way once the area eventually reopens. After the sweep, 84 people chose to accept city services, Cantrell said, but many others preferred to remain on their own. That led to the new encampments closer to the river, she said, or increasing reports of homeless people in parks such as Coliseum Square. In the short-term, Cantrell said, she has asked the mayor’s office for another “notice to vacate” the encampments in the area between St. Charles Avenue and the river. The city’s legal department is evaluating that constitutionality of that request, a spokesman for her office said. Unless lawfully permitted, the erection or placement of any tent, item of household furniture not intended for outdoor use, or other semi-permanent structure shall be considered an encumbrance/obstruction when placed on any of the public places or rights-of-way set forth in this Section. Permanent obstructions shall be prohibited. The original law — which applies citywide — already contained that idea, but the new language puts that intent into writing. The language, Cantrell said, should assist the NOPD and other city agencies when they are dealing with the issue. “That makes it clearer for them to enforce the law, but it has always been against the law,” Cantrell said. What the new language will not do, however, is prohibit the homeless people from returning to underneath the overpass or other areas. It only prohibits the tents and other furniture — meaning that the larger problem remains unsolved. Since the sweep, Cantrell says she has been personally working with two homeless families that illustrate the difficulty of addressing the broader issue in a humane way. One was a nursing mother whose infant child was placed in foster care after the sweep, leaving the woman bearing the physical pain of not being able to nurse and the psychological trauma of being separated from her baby. Another couple refused to be placed in a shelter because they didn’t want to be separated. Since the sweep, Cantrell said she has begun receiving correspondence from residents near the new encampments that has been disrespectful to the point of insulting. Instead, she said, she needs residents to help provide solutions beyond just a never-ending series of sweeps. Since she herself was a neighborhood leader in Broadmoor, she said, she has believed that the most effective answers come from the people living closest to the problem. Cantrell spoke for about 15 minutes at the beginning of the Coliseum Square meeting, taking a few questions and comments on the details of the law change but leaving quickly so that Convention Center officials could begin a presentation on their expansion plans. 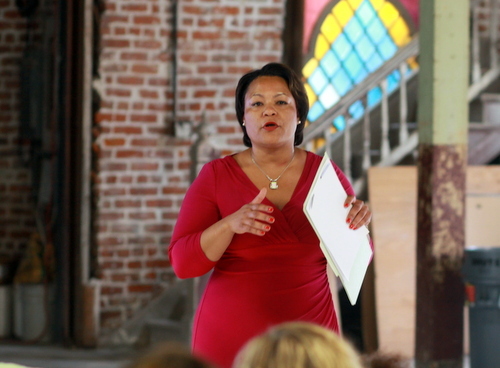 As she left, Cantrell reiterated her plea for any residents with more ideas to her office. “I’m serious when I say I’m looking for solutions, because I don’t have them,” Cantrell said. Solution to problem : enforce the freaking law. These people are offered help and a roof over their heads and they turn it down every single time. They are homeless by choice. All their tents are new! We have open shelters for them, we try to get them in, but they choose to live in new tents under the expressway because city leaders choose to not enforce the law. Take away the tents and the furniture and they will be forced into not being homeless anymore and actually accept the help. Moreover, we need to change the open container laws in this city. It is a constant problem among homeless camps and alcoholic camps on Claiborne, of people drinking to the point of passing out. Open containers should not be allowed anywhere on our streets! Only allow go cups from restaurants or bars that clearly list the label of the establishment, otherwise walking around with open beer cans or liquor bottles should be illegal. A suspension of this law can be made during mardi gras, but other than that the only open containers that should be allowed are containers with the names of establishments that sold them. So only people who can afford drinks from restaurants and bars will be allowed to drink outside? Yeah, I can’t afford that. Seems to work everywhere else in the country. Good lord, that is not a solution. There is no law against being homeless. There is not law against being on public property. There is no law against loitering or whatever you want to call it. Take away their tents, many will just sleep on cardboard. Take away the cardboard they’ll find something else. Come winter a few might die from the cold, which perhaps is your solution? Good luck in 1) taking the go-cup from the people of New Orleans and 2) enforcing your idea. Cops inspecting everyone’s beverage container? Have you seen our dwindled ranks as it is? And what do you propose to do to prevent people from refilling their approved (by you), labelled containers and walking around some more? There is ample space for everyone left living under the bridge in shelters. Ample. A few might die from winter? well are we now talking about suicide prevention? There are places for these people to stay, THEY ARE REFUSING IT, what is so difficult to understand about that? What are you talking about taking go-cups away from people? I am saying that they should be allowed. Have you never left New Orleans? This is very similar to the laws in 99.9% of the country. Exactly, what is so difficult for YOU to understand that. It doesn’t matter if there’s room in the missions, a good number of those folks choose to be on the street. You can’t “enforce the freaking law” on people who refuse to obey it and have nothing to lose. You could fine them. But they don’t have money to pay the fines. You could jail them, but prisons are already maxed out and I think we’d both prefer violent criminals get cell space rather than the homeless. You could truck them somewhere else but 1) we don’t have the resources, 2) you’ve got constitutional issues and 3) that’d be even worse PR for the city. All I’m saying is that this issue isn’t an easy fix like you think it is. You *cannot* force people into not being homeless. It’s authoritarian and rather simple minded. You are truly a jerk. What if someone in your family had issues and ended up living under the bridge and wouldn’t accept the type of help they were offered? No wonder Cantrell had to remind people that even the homeless are human beings. I am a jerk? I am proposing a solution that will work, you are promoting more of the same. 1. Do nothing. Doing nothing is not a plan, but some seem quite happy with this approach to continue to allow people to live under bridges, in camps with no bathroom, electricity or anything resembling humanitarian bare minimums. 2. Doing the same. This seems the approach you are calling for. Currently, dozens of volunteers visit these camps weekly and offer housing services to these individuals. Furthermore, food and clothing is provided to them and the generous misguided citizens of this city keep giving them money, despite the requests by homeless activists in this city for people to discontinue giving them money. Under this method, activists and people I assume like yourself will continue to offer housing assistance to these individuals, which they will continue to refuse. 3. Unconstitutionally arrest them. Make it illegal to be homeless and to panhandle. 4. Enforce the law. You are not allowed to have furniture under the interstate, nor can you just decide to set up camping tents on public property. This approach at the very least will help persuade people into receiving help by accepting addiction recovery services, housing services, and job training. If someone in my family was under the bridge refusing help, I sure as hell would not want people to assist them in achieving their goal of living a homeless lifestyle full of drugs and with ZERO mental health services. If you really care about these people then you should support measures to force them into getting assistance. The people left under that bridge fall under 3 categories, mental health, addiction, youth. The youth are just there for the experience, very few left but I see them every now and then.The individuals with addiction and health issues are not accepting the help we are offering, period! so apparently you are comfortable with them dying a slow death due to addiction or to continue to elude treatment for their mental health issues. We have to find a way to force these people, in a constitutional manner, to get help, but sitting here and doing the same will not WORK! We will never find solutions if we don’t know how to speak to each other. And, yes, the homeless are people, too, many suffering from mental illness. I don’t mind the encampment. It’s the Storyville effect–by keeping the problem in one area, it keeps it out of everywhere else. My only concern was that the area flooded during the big rain in…was it March? I don’t believe that area is prone to flooding, so I was wondering if the homeless in that area had been using the local storm drains for trash, causing a drainage issue. As far as suggestions go- why not try things that have actually worked in other places? “Housing First” programs that provide housing that actually suits the needs of the homeless (not just shelters) appears to work best. He still has 7 years, hold your horses.